Type and Characteristics - Brig-rigged wooden sailing ship; 144 tons; length 88&apos;; beam 21&apos;9"; depth. 8&apos;5"; complement 17. 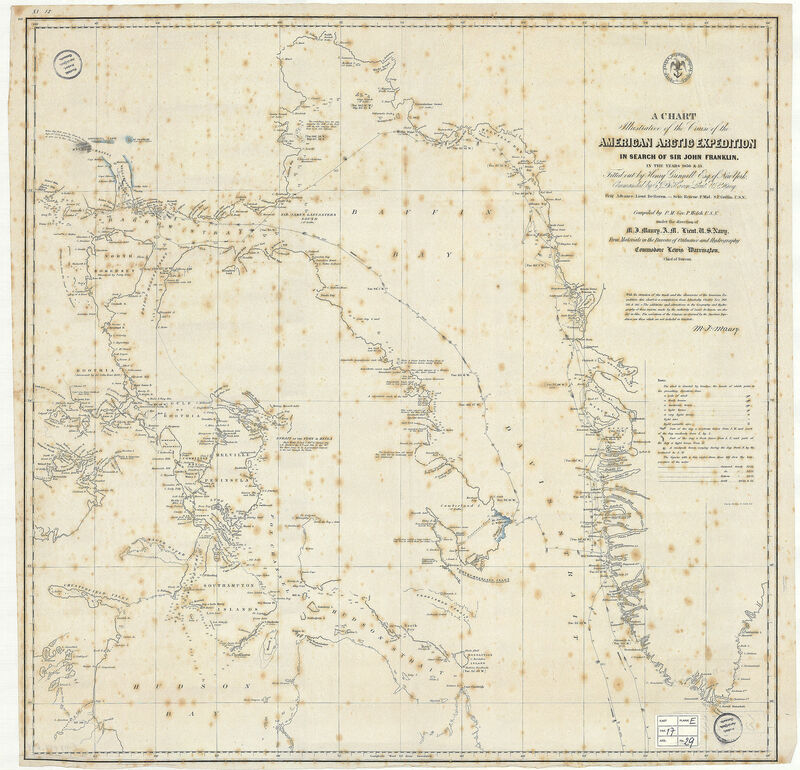 Log Period and Areas of Service - 1850-1851, Canadian and Greenland Arctic, searching for Sir John Franklin's Arctic expedition. 23 May 1850 – Left New York Harbor on the First Grinnell Expedition, commanded by Lt. Edwin J. De Haven. 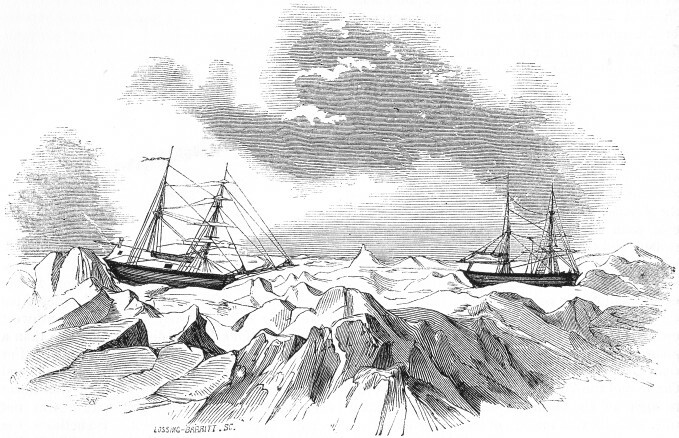 29 June 1850 – In company with brig USS Rescue, she entered Baffin Bay and encountered pack ice. 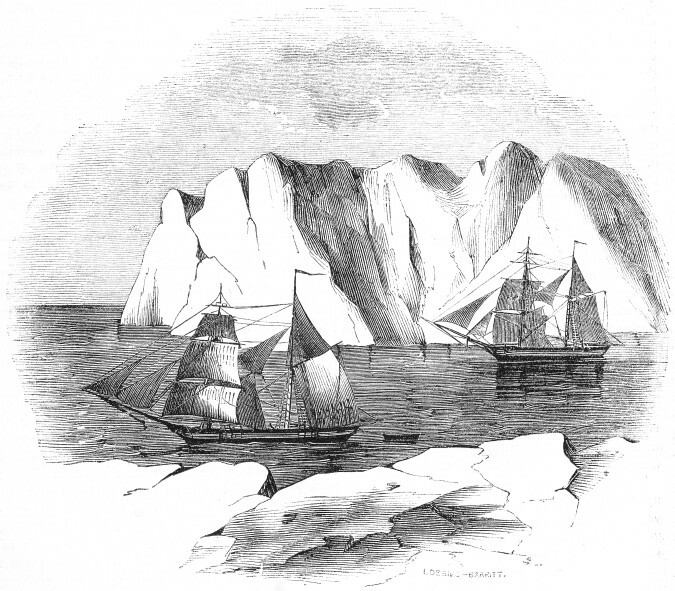 19 August 1850 – They got free of the ice and entered Lancaster Sound where they met two British vessels engaged in the same mission. Advance and Rescue were separated that night by a storm. 26 August 1850 – Finding Wellington channel blocked by ice, they turned back and found more British ships searching who had found evidence of the Franklin party. With improving weather, they all proceeded back north and stopped by Beechy Island where three graves were found at what had been the Franklin party’s first winter camp. 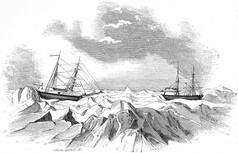 Mid-September 1850 – Advance and Rescue attempted to go north into the Wellington channel again, when the ice closed around them leaving them drifting with the ice floe for the entire winter. 8 June1851 – Advance finally worked her way clear of the imprisoning ice and they proceeded to Disko Bay to replenish their stores. The ice proving heavier than the previous year, prudence dictated that the mission be abandoned for the time being. 30 September 1851 – Advance arrived back in New York harbor. Both ships were returned to Mr. Grinnell, and he immediately began outfitting Advance for another Arctic expedition. Preparations for the second Franklin rescue expedition took about 20 months. 30 May 1853 – Advance departed New York harbor, Passed Assistant Surgeon Elisha Kent Kane in command. 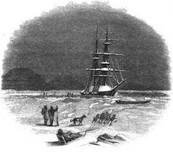 7 August 1853 – After acquiring supplies and sled dogs at Upernavik, Greenland, proceeded north out of Baffin Bay into Smith Sound and the Kane Basin before being stopped by ice, choosing to winter among a group of islets. 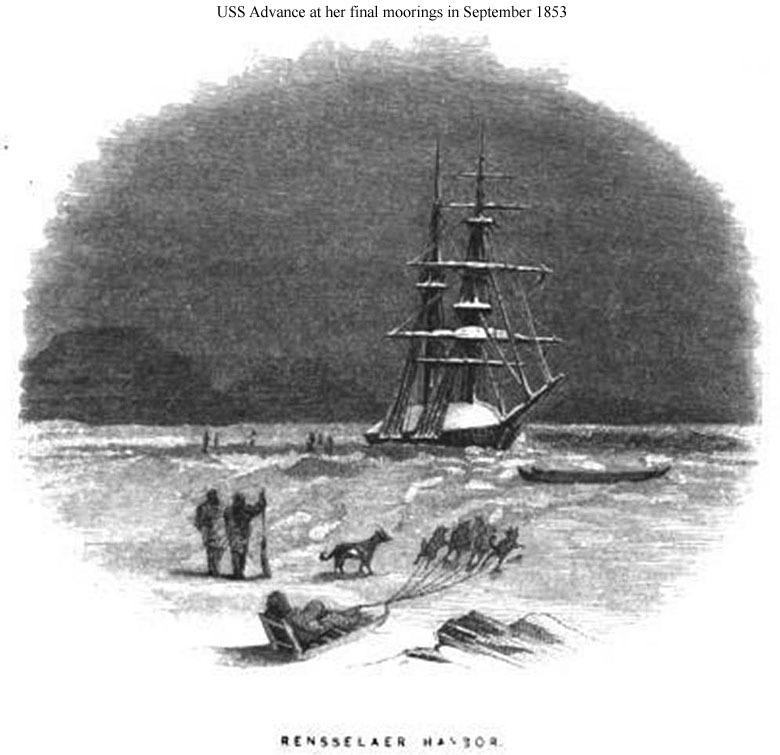 10 September 1853 – Advance was imprisoned in the ice. The interior of the ship underwent extensive preparations for wintering, and the crew began expeditions across the frozen wastes both on the Greenland shore and the frozen pack. Kane and his officers also established a scientific station to observe climatic conditions and to make astronomical calculations. But they were hampered by the loss of almost all their sled dogs to disease. Late March 1854 – Many exploring parties suffered from frostbite and exhaustion. Fatigue and illness of all associated with the rescue expedition prevented Kane from undertaking further searches until the end of April. Eskimos arrived in the area, and Kane bartered with them for additional sled dogs. 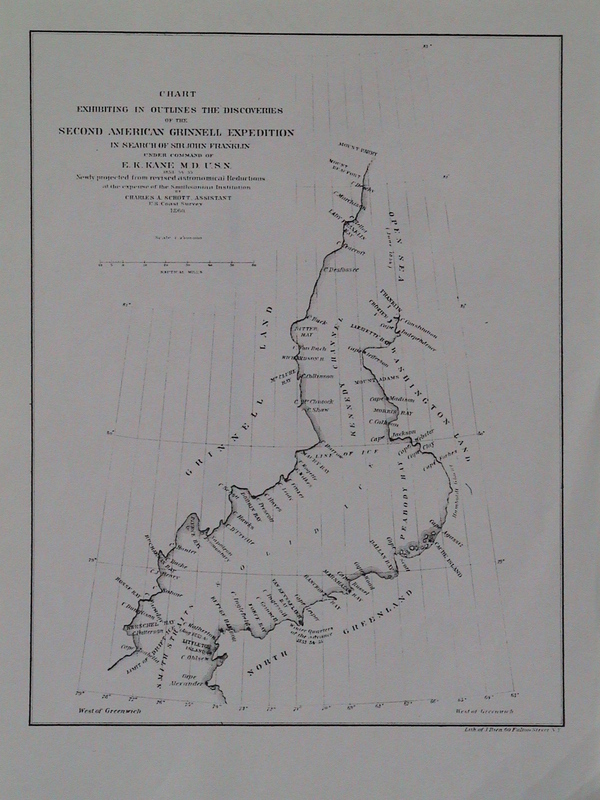 Summer 1854 – Search parties ranged the far northern coasts of Greenland and the eastern coast of Ellesmere Island searching for evidence of Sir John Franklin's party and making notes on geography and climate. Autumn 1854 and Winter 1854-55 – Advance's crewmen passed the second winter in a state of near hibernation. Scurvy-that dread disease of the sea-riddled their ranks to the point that Kane and one other man only remained to attend upon the sick, and carry on the daily work of the ship. Kane decided to abandon the ship-still frozen solidly in the floe-and make it across the ice to the Danish settlements of southern Greenland. 15 May 1855 – Two 25-foot whaleboats and a 13-foot dinghy were mounted on iron-shod wooden runners and were prepared for the journey and then loaded with provisions. 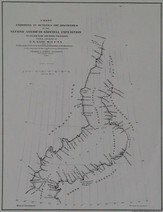 A way station was stocked at an abandoned Inuit hut some 35 miles south. They began their trip south with the dog sleds, abandoning the Advance still frozen solidly in the floe. 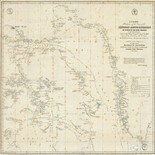 The men reached Cape York on 21 July 1855, where they erected a rock monument in which they left information regarding their planned movements, a list of provisions on hand, and a brief summary of the expedition's findings. 6 August 1855 – The Kane led his exhausted party into Upernavik. 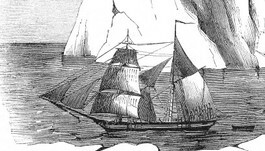 They took passage from Upernavik in the Danish brig Marianne to Disko Island where they were met by the relief expedition made up of USS Arctic and USS Release under the command of Lt. Hartstene. 11 October 1855 – The two relief ships brought the survivors into New York. 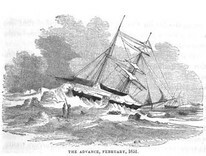 Presumably, the pack ice eventually crushed and sank the abandoned Advance. 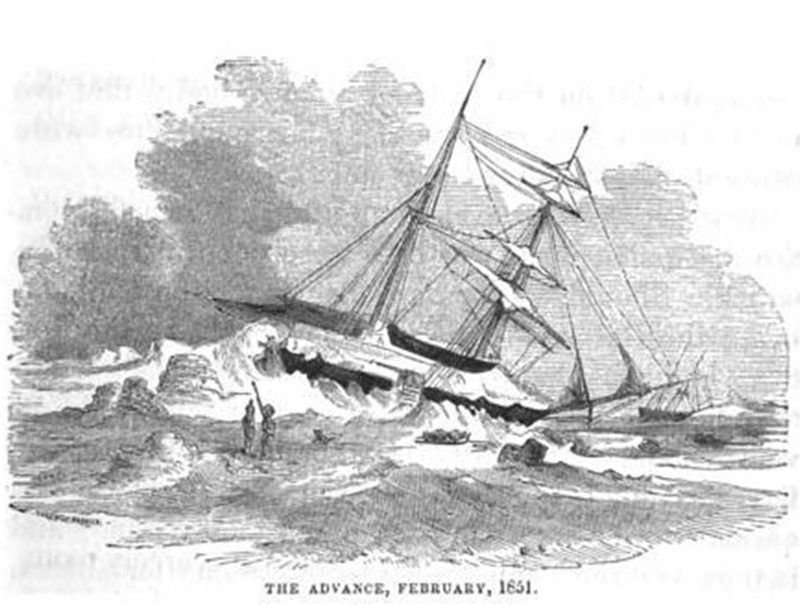 Fate – Abandoned to Arctic ice in May, 1855, she was probably crushed by ice and sank.